If you’re planning a trip to Austria, it’s useful to know the special names of a few foods and traditional dishes you’ll find in Austrian cuisine. On my own first visit, I missed out on some delicious foods because I didn’t actually know what they were. If you’re in London, you can practise by following up some of the suggestions in my blog post “Where to get German and Austrian food in London“. I’ve mixed up some of my own experiences of Austrian food with the linguistic aspects I learned about in an inspiring talk at Europe House, London* by Lukas Mayrhofer, a gastrosophist. That sounds medical, but no, it means a specialist in the science and art of good eating. His talk – “The history and culture of Austrian German, with a focus on the linguistics of Austrian cuisine” – makes eating out into something educational. He began by describing two of the dishes on offer in an Austrian or Bavarian restaurant: Tafelspitz and Kaiserschmarrn. 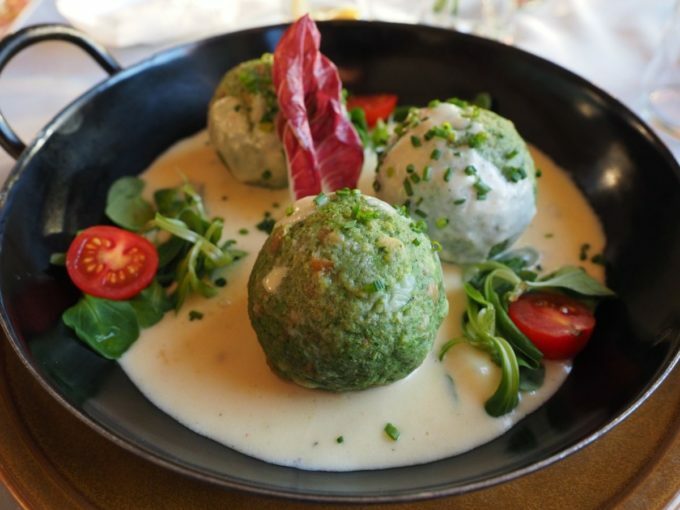 A savoury dish to start with: Tafelspitz was originally the “Lieblingspeise des Kaisers” – the Austrian emperor Franz Joseph’s favourite dish. Literally it means “meal high-spot”. Franz Joseph ruled from 1848 to 1916, and he was the longest ruling emperor of Austria and king of Hungary. His Tafelspitz consisted of beef in broth with spinach, roast potatoes, apples, and chives. That’s why Austrian cuisine is still renowned for beef stew in general. For my own main course I would go for Käsespätzle mit grünem Salat, a delicious dish you can find all over Southern Germany and Austria. It’s cheesy noodles topped with crispy onions and served with green salad. The noodles (Spätzle) originate from Swabian cuisine, are irregularly shaped and absorb lots of flavour. The name means little sparrows, from der Spatz = sparrow, and the best ones are handmade. The shape tends to be fat in the middle, making the silhouette of a bird. In my student days in Freiburg I had a friend who made her own Spätzle. If I think about it I can almost smell the caramelized onions on the top of the Käsespätzle. Lecker. 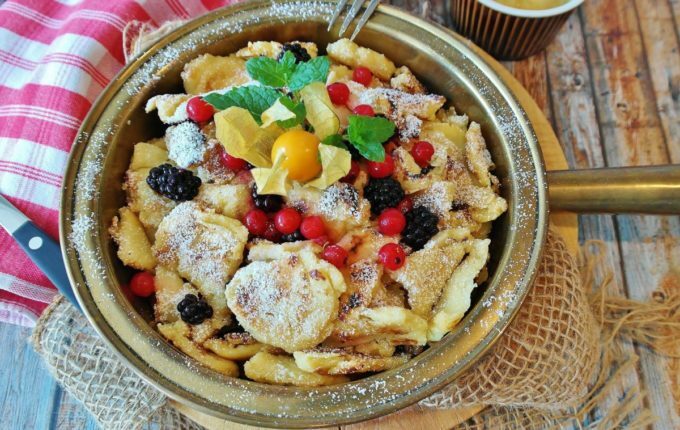 And for desert: Kaiserschmarren was also a favourite of the Kaiser, as you can see from its name. 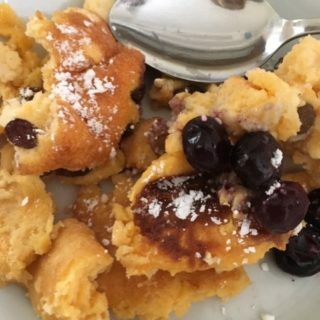 It’s a torn pancake with raisins, eaten with plum or apple compote or fresh fruit, and Franz Joseph used to enjoy a plateful of this after a walk around his enormous garden in Schönbrunn, Vienna. Schmarren means “something made in a pan”, OR “nonsense” or “mess”. That explains the funny translations on your menu, such as “Caesar’s Nonsense” or “Emperor’s mess”. Perhaps the closest in English would be “Emperor’s shredded pancake”. You’ll find it hard to avoid ordering this dish at least once during a visit to the area. It’s even on offer in the Almhütten, the Austrian alpine huts. 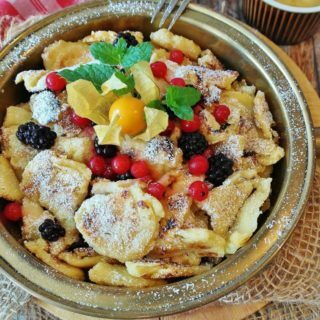 At first you can’t imagine eating a sweet pancake as a main dish for lunch, but once you’ve lived through a few lunches with Germans or Austrians tucking in all around you, you’ll give in. Here’s an elaborate version with lots of fresh fruit. Quite apart from the special Austrian and Bavarian dishes, there are special differences in the language used in cooking and eating. German is a pluricentric language, which simply means a language spoken in more than one country – it has more than one variant. The dominant form of German is Standard German. Standard Swiss and Standard Austrian German are non-dominant variants of German. 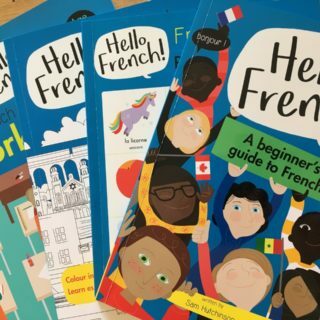 Most German speakers live in Germany, so textbooks teach German German and that causes confusion among learners when they come across Swiss or Austrian German. 95% of the words are the same, but the ones that do differ are really common and they often describe something very important: food. In the EU translation department, no less than 23 Austrian culinary terms are protected in their Protokoll! You can find Austrian or Swiss variants in the Duden online dictionary; Duden has long been a well-known print dictionary and Konrad Duden produced the first version as long ago as 1880. A book called Varientenwörterbuch des Deutschen (Variant dictionary of German) also lists 12,000 Austrian German words and phrases. The differences are in vocabulary, grammar and phonetics, and I’ve come across them nearly as often in neighbouring Bavaria as in Austria itself. I’ve listed some words connected with food below, writing the Austrian words in bold print to make them stand out. Erdäpfel for Kartoffeln, potatoes, literally “earth apples”. I love these compound nouns. Topfentorte for Käsesahnetorte, a creamy cheesecake. Also there’s Topfenstrudel, curd cheese strudel, delicious and I’ve only ever eaten it in Austria. Schlagobers for Schlagsahne (Swiss = Rahm), whipped cream, delicious with the vanilla sauce accompanying your Strudel. Eiskasten for Kühlschrank (Swiss = Eiskasten) ‘fridge, literally ice box. Many special Austrian words come from Slavic languages, whose speakers settled in parts of Austria. Austria is the gateway to the Baltic states, an emigration country, and used to be part of a vast empire, so there’s always been plenty of influence from other countries. Mayonnaise became Eier-Öl-Tunke! This has to be my next-favourite culinary word, rated purely on sound, after Schwarzwälderkirschtorte. My husband’s phonetic favourites are Speckbohnen (green beans with ham) and Petersilienkartoffeln (parsley potatoes). These two seemed to follow us around everywhere on our first Austrian holiday together. Nockerl – semolina dumpling; Salzburger Nockerln are a dessert, sometimes served with a fruit sauce. Schmankerl – 100 years ago this meant one particular thing – a wafer for ice cream (German Waffelröllchen) – but it has come to mean all sorts of snacks. It’s often seen on the front of refreshment kiosks. In my blog post “Dictionaries can be dangerous things” I’ve included an anecdote about the hazards of translating – or not translating – this word! Prepositions and articles can differ. Austrian das Jog(h)urt, German der Jog(h)urt. So in the supermarket you only need to look at the label and you can see where the yogurt comes from. The key is whether it’s Griechisches Jogurt or Griechischer Jogurt! 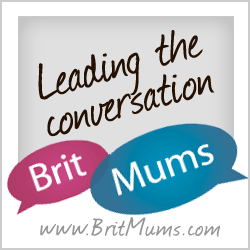 Kaffee – the emphasis is on the 2nd syllable, not on the first as it is in German. During the break after Lukas Mayrhofer’s interesting talk, we sampled some Austrian delicacies: Apfelstrudel, cheese spreads…. There was a different sort of “taster” in the second session: a language taster class to get the participants speaking their first words of Austrian German. The idea was that by the end of the evening, everyone would be completely confident about ordering special Austrian dishes like Tafelspitz or Kaiserschmarren on their travels in Austria or in its neighbouring German Land, Bavaria. Guten Appetit! That’s the same wherever German is spoken. *This Austrian German Language evening was held in November 2018 at Europe House, Smith Square to celebrate the Austrian presidency of the Council of the EU, a period covering the second half of 2018. The event was run in conjunction with the Austrian Cultural Forum.